When the opportunity to sample the delectable, exquisite Japanese cuisine at Ten Japanese Fine Dining Restaurant which was relocated at Marc Residence (nearby KLCC) recently, I was eager to sample some unique dishes from the Land of Rising Sun that is rich in culture and history. Strategically tucked in the lifestyle-oriented residence along Jalan Pinang, TEN is a restaurant ideally suited to those who treasure life's finer moments. The cosy space is decorated in dark earthy tones, with glass flooring and automated doors being part of the futuristic design, enhanced by warm lighting which further adds to the ambiance. In Japanese, "Ten" literally means Heaven. And true to its name, the Japanese culinary team are experts in whipping out a feast of gastronomic delights, using only the finest seasonal ingredients. To deliver the best of its service, the waiters and waitresses originated from Japan welcomed us with friendliness and smiles. I was honored to dine with the friends of media before the restaurant was actually open for the public yet. Featured in the cocktail menu this month, Aisome Punch was the house specialty green tea based cocktail which surprised us as it tasted mildly zesty with the barest hint of sweetness. Also known as Ten's most exotic cocktail. Vodka and lemon served with soda was commonly seen in many places, but here in Ten they incorporated some Yuzu liquor to enhance the thrilling and zesty flavour of the beverage. Refreshingly light but reflected a true taste of Japan. I was playing safe with the drinks, so I ordered a glass of mocktail instead. Muddled fresh grapes was paired with raspberry to enhance the fruity sweetness in the concoction, and mint was a welcoming addition that made the drinks more refreshing and cooling. 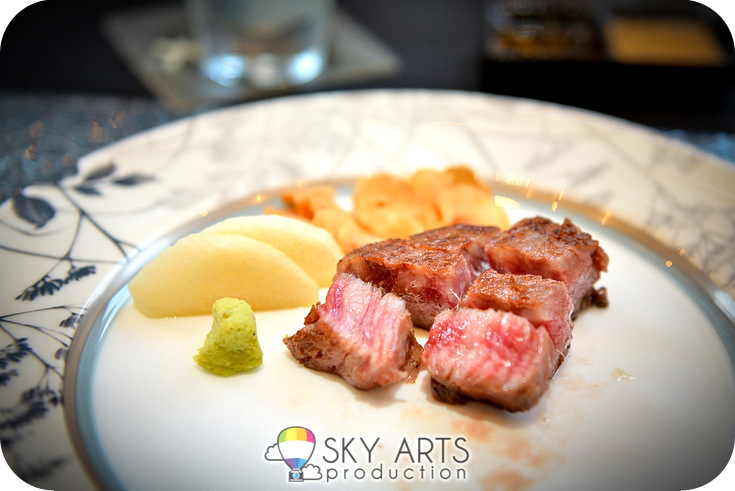 it was enticing as one of the main courses was the premium beef air-flown from Japan. Dango, our Japanese appetizer to start the loving gourmet adventure is a Japanese dumpling made from Mochiko (rice flour) and seasonal vegetables. You can relate it with the sweet Mochi dessert, but Dango comes in savory soup. Simply adored the lightly firm and chewy texture with its salty goodness. I was surprised to find a melting chunk of foie gras in it! So delicious. Featuring the best in raw and fresh treats, next up was a myriad of assorted sashimi and sushi. 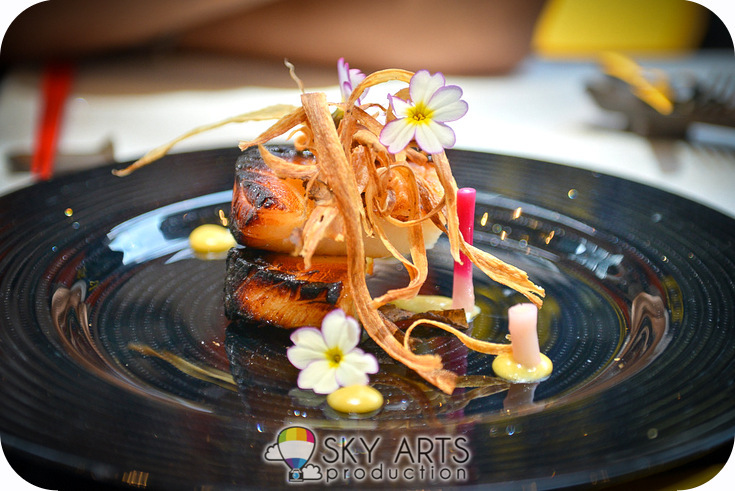 Slices of salmon, white tuna, yellowtail, eel and scallop were capped with an array of ingredients and flavors. Sashimi lovers would find this platter an intriguing dish. The highly-prized wagyu beef was among the stars at this restaurant. Served with Tasmanian garlic chips and vegetables, the beef was pan-grilled into customer's preferred level of doneness. As recommended by the chef, we had our meaty portion medium rare. It was my first time having beef teppanyaki with wasabi, and the meat offered an amazingly succulent taste as it melted in the mouth. Definitely a special main dish that would keep their guests glued to their seats! Diners may love to explore TEN's seafood menu as well. While the miso marinade was used, the fragrance did not mask the essence of the fish-- the seabass beautifully retained the rich taste of its succulent white flesh. The entire combination came together beautifully and I really tasted the interplay between the oceanic taste and the flavour of miso marinade. For dessert, we had a piece of heaven on our plate. The silky luscious green tea layer was nicely touched with tinges of sweetness from the chocolate. 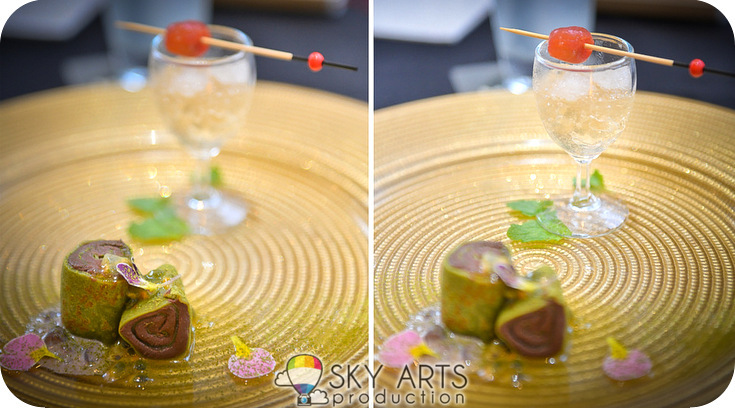 I simply loved the impressive flavour of the contemporary dessert combined with sweet and sour plum jelly that feels light in the mouth. Each bite was divine in the mouth. 1. I always have deep cravings towards Japanese gourmet, and it's truly a gastronomic enjoyment! 2. The ingredients are fresh and of top-notch quality, and I am impressed with the unique flavours created using traditional Japanese ingredients. The most distinctive part of TEN that stands out from the others is the modern, unique menu that surprises diners throughout their gastronomic journey. 3. The experience of a good meal encompasses great tasting food, fine atmosphere of dining area, the prompt and friendly service. TEN has indeed achieved excellence in all the above! I'm having a look forward to your next publish, I will attempt to get the dangle of it! Food looks good ^^ wagyu beef looks juicy. The dessert so petite in size, mana cukup! the beef looks pretty good...no price tag? The restaurant decoration is very nice. The food look very fusion too. Canon's deal with detection can acknowledge as much as. No matter how much you pay for something, it's going to have something about it that you either don't like or don't require. Section 2 - Modifying the Monochrome Picture Control. the photo moments in your life.